Have you gotten on the train yet? I have long had an interest in body’s myofascial system and have pursued continuing education on this subject. I often use myofascial release techniques as part of my treatment programming. 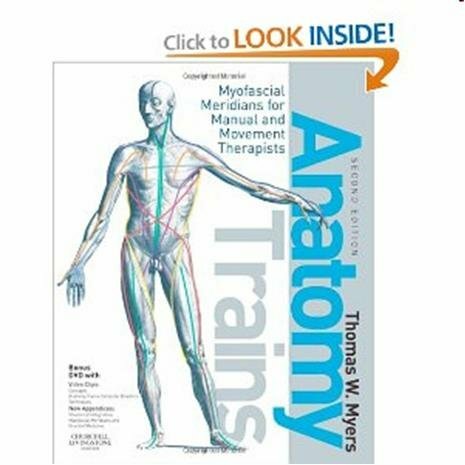 One book that helps to lay out the body’s myofascial system and puts it on a “shelf that everyone can reach” is Anatomy Trains by Thomas Myers. (I was able to borrow it from my local library). There is a ton of fascinating information in this book. It doesn’t speak to technique in regards to the treatment of myofascial release so much as it lays out several “myofascial meridians”. It lays out these “lines of pull” in a unique way that is relatable and can be put into practice. I highly recommend this book – whether you have a firm understanding of the myofascial system or if you have little to no knowledge. One little test that you can use as both an evaluation tool and a treatment that helps to demonstrate the integration of the myofascial lines into function involves the region of the plantar fascia. (I tried this myself and the results were undeniable). Have an individual (again, you can be the model) bend over to touch the toes keeping the knees straight. Pay attention to the resting position of the hands and to how things feel posteriorly. Once you get a baseline, roll the bottom of your foot on a tennis ball, golf ball, or even a baseball. Spend about 3-5 minutes rolling – heel to toes, medial and lateral and be slow and deliberate as opposed to fast and haphazard. Once you have finished rolling, recheck to see how far you can reach on the “treated” side and also pay attention to the level of tightness. In most cases, you should see some pretty dramatic results. I saw about 2-3 inch difference in reach after rolling. I then repeated on the opposite side and again saw improved ROM. The point of this particular exercise is to demonstrate how the myofascial system intertwines and how restrictions in a single area can cause decreased function in another region. The bottom line – if you have yet to delve into the body’s myofascial system, this book is a great place to start. If you think you have a pretty good knowledge of this subject – my guess is that you have yet to see the subject presented in this way. Regardless, this book will help you gain new perspective and certainly give you more insight as you apply this knowledge to the treatment of your athletes and patients.